As "Wiz the Wizard" in the Elmgrove panto in 1968 or 69. December 1970, to have my tonsils out. It was at Charing Cross hospital - the old one that was right in the middle of Central London. A goldfish called Highfield that was duly eaten by the cat. Her name also began with a J, but it wasn't the same one. The Market Tavern, Hitchin, on Friday night after choir practice, sometime in 1977. New Year's Eve 1983. I was well over-age by then, but two of the people I was with looked younger. Sometime in the early 80s, for relieving myself outside St Mary's in the early hours of Christmas Day after attending Midnight Mass. I won't name the former Hitchin Boys' School head boy who was with me. The latest edition of Total Politics magazine focuses on the 1979 general election which was of course 30 years ago next month. I have contributed a tangentially connected "Where Are They Now?" piece about the former Labour MP Maureen Colquhoun who lost her seat at that election after having become Britain's first openly lesbian MP during the course of the previous parliament. It is not a story that reflects particularly well on British society at the time or more particularly on the Labour Party. Mr Dale has tagged me to complete something called the "Twenty Firsts Meme" and since this seems like a chance to take a bit of a trip down memory lane, I'm happy to oblige. Working behind the counter at the Barracuda fish and chip shop, Hitchin, on a Saturday. It was, as they say, a good way to meet people. Administration and Finance Officer of UCL Student Union 1983-84. The first, and only time, I have ever stood for elected office. The Pushbike Song by The Mixtures. Look, I was nine, okay? Arsenal v Leicester City at Highbury, with my late uncle Eric, sometime in the 1972-73 season. Genesis at the NEC, 22 December 1981. Holland, on a school trip, in 1976. We had to go through Belgium to get there, of course. Songs of Praise in 1978. St Mary's, Hitchin, was featured in the programme and I was in the choir. Probably in about 1981 or 1982 at the UCL students union, but I can't remember what it was about. Her name began with J, but I am certainly not going to be any more specific than that on a public website. We were having a family meal at a Hertfordshire restaurant some time in 1971/72 when Eric Morecambe came and sat at the next table. Nearly drowning in the sea off the south coast of France while on holiday there in 1984. It was in Sycamore Avenue, Kirkby-in-Ashfield, Notts. I moved in on what must have been the hottest day of 1987. Discussing the resignation of David Bookbinder as leader of Derbyshire County Council on GMR (Greater Manchester Radio) in 1992. I was the local government correspondent of the Derby Evening Telegraph at the time. I think this was possibly Willie Whitelaw, during a campaign visit to Hitchin in the '79 general election. Other than the student union election referred to above, I have never played an active role in any election of any kind. I am supposed to tag five others, and although I don't believe there should be any compulsion attached to this, I gently and respectfully suggest the names of: Barnacle Bill, Little Man in a Toque, Mars Hill, Party Political Animal - either one - and View from the North. The Tory pundits, stuck in the battles of the 1980s and 90s, think the proposed 50p tax rate will lose Labour the next general election, but that's really not the issue now, and there are plenty of other good reasons why the Brown Government is almost certainly doomed. Here's today's Journal column. It is a measure of how much the recession has changed the nature of political debate in Britain that this year’s Budget headlines focused on the kind of issues which once left most people bemused. Thirty years ago, the Budget was all about the price of booze, fags and petrol. More recently, the main interest has lain in whether rates of personal taxation were going up or down. 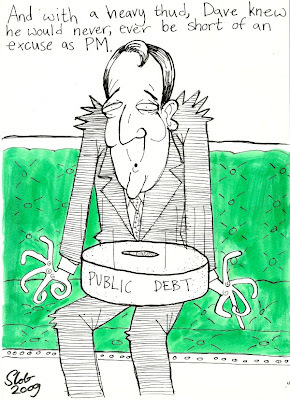 This year, though, people seem to care more about the public sector borrowing requirement and the ratio of debt to GDP than whether they will be a couple of hundred pounds a year better or worse off. Is it down to our increasing economic literacy as a nation? Or simply a reflection of the astronomical sums of money being thrown around as Chancellor Alistair Darling tries to rescue the stricken economy? The days when Gordon Brown as Chancellor concluded his Budget speeches with a rabbit-out-of-the-hat designed to send Labour backbenchers into paeans of ecstasy already seem very far away. Those naïve enough to be looking to Mr Darling to produce such a rabbit on Wednesday will no doubt have been sorely disappointed. For one, he does not have the room for manoeuvre needed in order to procure a last-minute crowd-pleaser, and in any case, he is not that sort of character. Mr Darling’s low-key, calm authority is one of the few political assets Labour still possesses in this otherwise dire situation. He was surely right not to try to play the showman. The nearest thing to a surprise in the Budget was the car scrappage scheme to give people an incentive to buy new motors and so help the car industry out of the doldrums. No doubt it will encourage some to trade in their old bangers for shiny new models, thought the main obstacle to this remains the reluctance of the banks to provide credit. Elsewhere, the £500m to kick-start stalled housing projects will be a welcome boost to the construction industry at a time when the market has gone flat, although there have been signs that it is reviving of its own accord. Much of Wednesday’s package though – for instance raising statutory redundancy pay by £30 a week – seemed like pretty small potatoes in view of the extent of the crisis. Much attention inevitably focused on the decision to introduce a 50p top rate of tax from next April, but I cannot believe this is the defining issue which many Conservative commentators have made it out to be. The recent row over MPs’ expenses and the backlash against bankers’ bonuses seem to me to be indicative of a new mood in the country that is now ready to see the rich pay more. The 50p top rate will affect just 1pc of the population, the great majority of whom are based in London and the South, while the amount of money raised - £3.3bn over the next three years – is hardly going to repay the national debt. Freezing the top rate of tax at 40p doubtless helped win over the “aspirational” middle classes to Labour in 1997. But times change, and even policies as iconic as this one ultimately have to change with them. The tax pledge was a direct response to the fact that Labour’s old tax-and-spend reputation had lost it the 1992 general election. But the 2010 election will be decided on very different issues. What will almost certainly lose Labour that election is not its taxation policies but the dire state of the public finances, with borrowing levels for the next five years set to be £175bn, £173bn, £140bn, £118bn and £97bn. Could it all still come right for Mr Brown and Labour? Could this Budget yet be the springboard for election victory in the unlikely event that Mr Darling is proved right in his forecasts and growth picks up again from the end of the year? Well, if you had asked me that question a couple of months ago, I would have said yes – on the basis that it is “the economy, stupid” that usually determines election outcomes. But then came the damaging row over Home Secretary Jacqui Smith’s expenses and the truly appalling “smeargate” scandal involving former No 10 spin doctor Damian McBride. As a result, this government has now begun to take on the same air of decay and moral degeneracy that characterised John Major’s Tories in the run-up to 1997. To my mind, it is now inconceivable that the public will vote for another five years of this, even if the green shoots of recovery do start to appear by the time we go to the polls next spring. When Mr Brown became Prime Minister, his admirers – of whom I was one – hoped he would restore trust in politics by ending the spin culture that will forever be associated with the Blair years. But those who argued that Mr Brown was no different from his predecessor in this regard have been proved right, and the sense of optimism that surrounded the start of his premiership has long since faded. It will take much more than this grimmest of Budgets to restore that sense of hope. Thanks as ever to Slob for his Friday cartoon. My own Budget verdict will be here from tomorrow morning - thanks for being patient! I'm going to break the habit of a lifetime today and not rush to instant judgement of today's Budget. This is partly because now that I am no longer a political news reporter I can afford to take a slightly more reflective approach to such things, but also of course because it's a well-known fact that any Budget that looks good/bad on the day invariably looks the opposite 48 hours later. I will however comment on the selection of the British Lions Rugby Squad, and it is to say that English players have on the whole been pretty harshly treated. While I myself predicted a couple of months back that the squad would have a distinctly Celtic air about it, I still reckon Tom Croft and Delon Armitage in particularly have been very unlucky not to make the 37. Ian McGeechan says he has picked the squad purely on form over the last three months, but someone with as long a rugby pedigree as Geech surely knows that while form is temporary, class is permanent. Besides Croft and Armitage, other "class" players who can count themselves unfortunate are Ryan Jones, Gavin Henson, Mike Blair, James Hook, Dwayne Peel and Josh Lewsey. By contrast some of the players who have made it strike me as journeymen. McGeechan will no doubt prove me wrong and win the series, as he did in 1997, but I still can't escape the feeling that this is not our strongest squad. So much for cartoonist Slob's take on "Smeargate." Do I share his sense of nausea at the Adoration of the Guido that has followed the RedRag scandal and the defenestration of Damian McBride? Well, up to a point I guess. Paul Staines is at least right in his analysis of the Lobby, although the initial diagnosis that it had become part of a client media was not Guido's, but Peter Oborne's, in his brilliant book The Triumph of the Political Class. I myself watched it happening from close quarters and it became very obvious fairly early in my Lobby career on that you could not expect to receive help and favours from the New Labour machine if you also insisted on telling it like it was for the benefit of the readers who paid your salary. I made my bed, and although those contemporaries of mine who took the Campbell spin subsequently saw all sorts of exciting career doors opening to them, I have never once regretted the road I took. That said, there is a central hypocrisy at the heart of the Guido version of history that should not be overlooked. In my relatively limited personal dealings with Paul Staines, I have always found him to be an okay bloke - he even bought me a drink once - but when it comes to smear campaigns against rival politicians, his blog is the last word. 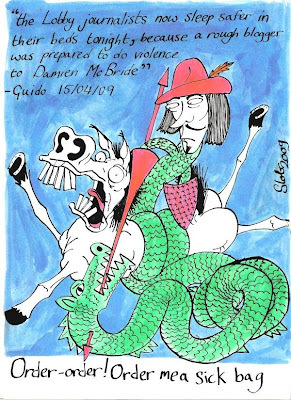 Back in 2007, Guido spent months attempting to convince his blog's many readers that Gordon Brown had been photographed on a rocking horse wearing a nappy, and to utilise the power of search engine optimisation and Google to spread this ridiculous tale across the entire internet. It even made it onto Wikipedia, and when I tried to remove it, some patsy came along and reverted my edit. He also gave house-room to a sock puppet called "Stanislav" who suggested, in one particularly disgusting post, that the Prime Minister had been steadily driven mad by the strain of repressing his "homosexuality" over many years - part of a deadly serious attempt by the right to fix the idea of Gordon as a "weirdo" in the public's mind. None of this in any way excuses the suggestion that David Cameron is suffering from some embarassing health complaint. But it does put it into perspective, and should serve as a corrective to those tempted to hail Guido as the new conscience of British public life. Labour of course should have risen above all this. Instead, it set up LabourList, bringing in Derek Draper as editor despite the fact that his previous spell as a NuLab adviser had ended in embarrassing circumstances for the government. It was, in short, a car crash waiting to happen. I disliked the idea of LabourList from the start. I was in fact invited to attend one of the breakfast sessions, and would have gone if I had been in London and at a loose end, but the whole thing seemed to me to be built on two false premises - firstly, the Dale Hypothesis that all left-wing blogs are basically crap, and secondly the Guido Hypothesis that smearing one's political opponents is a legitimate purpose of political blogging. In other words, Labour thought they needed a Guido-style "attack blog" to take the fight to the Tories, and they concluded that none of the existing left-of-centre blogs was up to the job. Had the party not got the first of these questions so catastrophically wrong, it would have realised that instead of trying to impose its command-and-control approach on the blogosphere, it would have been better off discreetly encouraging some of the excellent, well-established left-of-centre blogs that were already out there. In short, instead of listening to Dolly Draper, they should have listened to Sunny Hundal. His post on Liberal Conspiracy is the best defence I have thus far read of the left-of-centre blogosphere and why Labour would have been better tapping into that rather than attempting to out-Fawkes the Tories. Then again, New Labour has been ignoring its own natural supporters and trying to mimic the Conservatives ever since it was invented, so we should probably not be that surprised. Meanwhile the issue of "spin" has once again become the issue that defines New Labour, the single word that I suspect will be associated with the Blair-Brown government long after everything else it did has been forgotten. And those of us who thought Gordon would put a stop to all this nonsense have suffered another, perhaps terminal, disillusionment. Some would say a resounding yes to that question, especially in the wake of the latest MPs expenses scandal. But we wouldn't have known about it at all had it not been for another politician's pioneering legislation. Here's today's Journal column. A former Journal colleague of mine had a fairly straightforward view of politicians – one which, though I didn’t necessarily always share it, was at least admirable in its consistency. It was, in essence, that they were all crooks, and that it was basically the role of the press to ensure the public were made aware of this indisputable fact of life. It may surprise some readers to know that he and I had many a tussle over this question, my own default position being that, for all their faults, politicians are no more intrinsically good or evil than the rest of us. Looking at the continuing controversy over MPs expenses, though, I do begin to wonder whether my old friend might have had a point. In his case, it’s probably genuine. Mr Brown has been called many, many things in the course of his long career – but no-one has ever accused him of having his snout in the trough. 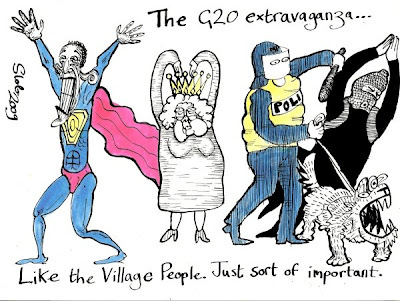 This week we saw Gordon at his do-gooding best, trying to fix the world’s economic problems with the help of his fellow G20 leaders and their trillion-dollar rescue package. Mr Brown is one of those rare people who still believes in the power of politics to change the world. If he is right in this instance, he may yet confound the sceptics and win that unprecedented fourth term in power for Labour. But whatever the long-term political impact or otherwise of this week’s G20 summit, the Prime Minister certainly could have done without the distraction of the latest expenses scandal. When I saw last Sunday’s newspaper headline about Jacqui Smith claiming back the cost of adult movies, my first thought was that it’s either going to cost the Home Secretary her job, or alternatively leave the paper’s editor facing a large legal bill. To date, it has done neither, but it has certainly focused minds on the need for reform of the system like never before. The three main party leaders have all now agreed to speed-up an inquiry into MPs expenses by the Committee on Standards in Public Life, but some fear the recent spate of revelations has already reduced Parliament to a laughing stock. Should Mr Brown have sacked Ms Smith? The temptation must have been very great, but as it happens, I think he has done the right thing by not giving in to it. To have dismissed the first female Home Secretary in our history on the basis of her husband’s taste for adult movies would have had the Labour sisterhood truly up in arms – with some justification. Rather than make a martyr of her by acting precipitously – as Tony Blair once did with Peter Mandelson - he has left her in place in the expectation that events will run their course. I suspect Ms Smith will make it easy for him and fall on her own sword. She has a wafer-thin majority in Redditch, and barring a major electoral turnaround, her career in frontline politics is almost certainly drawing to a close. But the issue of course goes far wider than the fate of one individual Cabinet minister. It is not so much a problem for Mr Brown’s government as for the entire political class. I cannot improve on the analysis provided by a pro-Labour blogger, Shamik Das, on the Labour loyalist website Labourlist.co.uk this week. “It isn’t just the perceived financial impropriety that appals taxpayers as the fact that many MPs simply do not believe what they are doing to be wrong. So out of touch with their constituents are they, that they actually believe the taxpayer should pick up the tab for bath plugs or pay-per-view films,” he wrote. One who certainly seems to have forgotten where he came from is Speaker Michael Martin, who showed once more this week that he is less the custodian of the dignity of Parliament than a shop-steward for greedy MPs. Displaying his unerring ability to shoot the messenger, he told the Commons he was “deeply disappointed” that 1.3m expense receipts from MPs which had been handed to a private contractor had now been leaked to the media. You might have thought that the holder of his office would be more “deeply disappointed” by the behaviour of the MPs who have tarnished the reputation of the House over which he presides, but no. Mr Martin is more concerned about catching whistleblowers – always in my experience a sign that an institution has lost touch with the people it is supposed to be serving. One final point to make about all this, though, is that it demonstrates the impact that has been made by that initially much-derided creature, the Freedom of Information Act. When the former South Shields MP and public services minister Dr David Clark first produced this piece of legislation in 1997, it was rubbished even by Cabinet colleagues, yet it has become a vital weapon in the hands of those seeking to uphold the public’s right to know. It may be making life difficult for the political class – but in terms of exposing wrongs that need addressing, FoI has already had a hugely positive effect on our political culture. Even my cynical ex-colleague might have conceded that Dr Clark was a politician who did some good.